Since the inception of the Whole30 program in April 2009, we’ve made one thing abundantly clear: This is not a weight loss program. It’s not a diet, it’s not a quick fix, and it’s certainly not a “17 Day Get Skinnier Than Your Friends” kind of approach. 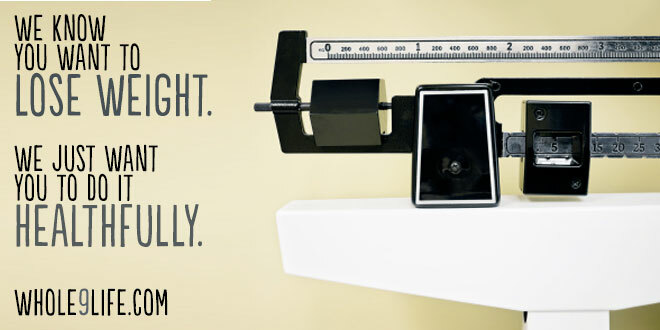 But that doesn’t mean we don’t recognize or value your weight loss goals. We know you want to lose weight. That’s why 90% of people undertake a new diet or exercise program in the first place, and that’s where 95% of our consulting clients are coming from (among other goals). And hear us clearly–wanting to lose weight or change your body does not make you shallow. It’s no more shallow to take on the Whole30 for weight loss than it is to use the program to clear up your acne, heal your psoriasis, or reduce the perpetual belly bloat you’ve been experiencing. Body image, as a dear friend recently mentioned on her blog, is a complex issue. Maybe you want to lose weight to improve your health. Maybe it’s for your self-esteem. Maybe it’s to feel more socially accepted, or loved. But for now, for our purposes, your reason doesn’t matter. It’s your own, and who are we to tell you it’s invalid, or less than worthy? Simply put, you’d like to lose weight. And we want to help you do it—healthfully and sustainably. So why do we spend so much time telling you we don’t care if you lose weight? From our perspective, we have to position the Whole30 as far away from “weight loss” as possible, for a few reasons. First, we will not allow our program to be lumped in with programs like “The 17 Day Diet,” “7 Pounds in 7 Days,” or “I Can Make You Thin.” These quick-fix programs all have three things in common: they focus only on weight and looks, they’re spectacularly unhealthy, and they all fail long-term. But more important, we come out hard against weight loss as a primary goal for your Whole30 because if we didn’t, here’s what we’d see: I’m doing the Whole30, but low-calorie. Or, I’m on the Whole30, but super low-fat. Or zero carbs. Or while drinking a Whole30 meal replacement shake for breakfast, another for lunch, and a light Whole30 meal for dinner. We already see these examples from some of you who come to the Whole30 with a weight loss focus, despite our efforts to redirect you towards health, changing habits, and improving your quality of life. You know why this happens? Because we’ve all been dieting our entire lives in an effort to lose weight. And the message we’re sold is that weight loss = restriction. So if your focus is solely on weight loss going into the Whole30, what will you do? Alter the plan to make it even more restrictive. And that, friends, defeats the purpose and the magic of the Whole30 altogether—and likely roadblocks your weight loss efforts, too. So we come out strong against focusing on weight loss during your Whole30. We don’t allow you to weigh or measure yourself during the program, citing five reasons you should dump your scale for good. We give you 174,203 things to measure besides weight loss to evaluate your Whole30 progress. We encourage you to focus on your health, because when you make yourself healthier from the inside-out, improved body composition, self-esteem, and happiness generally follow. However, make sure we’re clear on one thing: We also want you to change your body. We have to go above and beyond to tell you not to focus on weight loss during your Whole30, because (a) we know you’re probably going to anyway, to some degree, (b) we need to buffer your temptation to restrict, calorie-count, weigh yourself daily, and beat yourself up over the results and (c) we are desperately trying to change an obsession with body weight to a big-picture grasp of what it means to be truly healthy, and the radically improved quality of life that follows. But we do want to help you lose weight, healthfully and sustainably. Which is why our original meal planning template has safe weight loss built right into the design. And why we talk about other lifestyle factors like exercise, recovery, sleep, and stress—all of which play a huge role in weight loss and body composition. And more recently, why Dallas has been learning, studying, and working with test clients in a brand new, groundbreaking functional medicine training program—so that we can help those of you who need more than simple lifestyle interventions to restore your health and lose weight. But that doesn’t mean we’ll ever turn the Whole30 or our consulting program into a weight loss-focused effort. You want to lose weight, and we’re here to help—but the only way we’ll do that for you is by improving your health, in a sustainable fashion that you can maintain for the rest of your life. It’s what we do, and it’s what you need. So go ahead and continue your healthy efforts with weight loss in the back of your mind. Just don’t allow that focus to take you to a place where you start contemplating less healthy behaviors to get you there. Be patient. Find the right people to work with. And understand that you are worth more than the number on the scale—although we understand that the number is important to you.